Bundesliga | Marco Reus, Mario Götze and Andre Schürrle in World Cup winning form? Marco Reus, Mario Götze and Andre Schürrle in World Cup winning form? Borussia Dortmund coach Peter Stöger won't be the only man delighted to see a resurgent Andre Schürrle, Mario Götze and Marco Reus firing on all cylinders for the Black-and-Yellows - Germany coach Joachim Löw will also be rubbing his hands at the prospect of taking the trio to Russia this summer as Die Mannschaft defend their FIFA World Cup title. Hamstring problems. Ankle injuries. A partial cruciate ligament rupture. Metabolic disorders. Lack of fitness. Low morale. 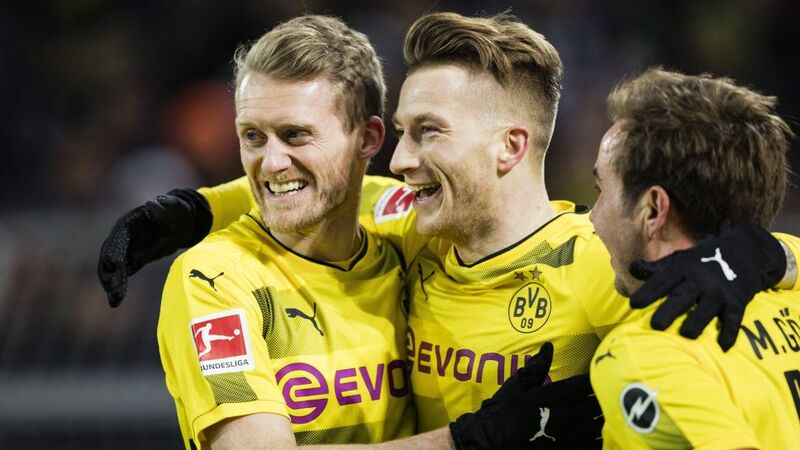 Fate has been anything but kind to Schürrle, Götze and Reus in recent seasons, which perhaps explains why it has taken them over a year and a half to finally start a game together for Dortmund, in Matchday 23's 1-0 win over Borussia Mönchengladbach. The trio have been clubmates since Schürrle arrived at Signal Iduna Park hot on the heels of Götze in July 2016. Fans and observers alike rubbed their hands at the prospect of seeing two of the country's most talented creative midfielders - not to mention the duo responsible for the winning goal in the 2014 World Cup final - link up with the third musketeer, Reus, one of the best of his generation and Germany's 2012 Player of the Year. Watch: Reus, Götze and Schürrle fit and firing! Expectation soon gave way to frustration, though, as injuries limited the trio to just 43 league appearances in 2016/17. It was left to others - notably Bundesliga top scorer Pierre-Emerick Aubameyang - to seize the limelight, although with seven goals in 17 appearances Reus still finished as the team's second-highest goal-getter, one ahead of Ousmane Dembele - who played twice as many games. The past 18 months has been a story of ups-and-downs, comebacks, and occasional flashes of the old magic. But maybe, just maybe - the time has come for the three great friends to finally get back to doing what they do best: playing football together. "It's amazing, it's a good feeling," Schürrle told bundesliga.com after the Gladbach victory. "We're very good friends, we've wanted this for a long time, and now it's finally here. We have to get healthy and play together like we used to." Schürrle and Götze have featured in five of the last six Bundesliga games under new BVB coach Peter Stöger, and seem to be rediscovering the telepathic understanding that underpinned that World Cup-winning goal, the one that will stay with them for the rest of their lives. The former teed up the latter for his strike against Hamburg on Matchday 22, while they were both involved in the build-up to Reus' sensational winner against Gladbach the following week. "Having that routine of playing regularly helps you gradually improve your form," Götze insisted. "You need to have confidence in your own game and keep working on your fitness to be at 100 per cent." As well as providing assists for Götze and Reus in his last two Bundesliga outings, Schürrle grabbed a late winner in the 3-2 triumph over Cologne, handing Stöger his first league win of 2018 after three consecutive draws. The former Wolfsburg star also got the opener in the Europa League last 32 first-leg win over Atalanta, while Götze came off the bench for Reus to notch two late assists for Michy Batshuayi. Reus himself - having spent almost nine months on the sidelines with a cruciate ligament injury - returned against Hamburg, before scoring his first Bundesliga goal in 274 days with a spectacular effort against former side Gladbach. The 28-year-old was delighted to start a game alongside Schürrle and Götze for just the second time, after an international friendly with Scotland back in September 2014. "I'm really happy," he smiled. "We always enjoy playing together, and it hasn't happened too often so far. We had a good run-out today, and I think we did a pretty solid job. But there's still room for improvement!" Stöger and the Dortmund faithful will certainly be hoping Reus can stay fit and improve on his remarkable record with the club, which stands at 57 goals and 42 assists in 127 Bundesliga outings. While the Black-and-Yellows essentially have no chance of closing the 19-point gap to leaders Bayern Munich in the remaining 11 games of the season, they will have a battle on their hands to stay ahead of Eintracht Frankfurt, Bayer Leverkusen, RB Leipzig and Schalke and qualify for the group stages of the UEFA Champions League. Schürrle, Götze and Reus are hoping to play a central role in making it happen. Watch: Reus, Götze and Schürrle: BVB's BFFs! "I have the confidence and the trust of the manager, and that's all you need," Schürrle emphasised. "Because if you're not on the pitch, you can't play well. I want to give everything. I want to play, to have fun, and at the moment I'm on good form, so I have to keep that going and look forward." Keeping Dortmund on track is one thing, but there's also the small matter of this summer's World Cup in Russia. If they are all fit, it is hard to see Löw overlooking any of the BVB trio as his reigning world champions look to navigate a tricky Group F containing South Korea, Mexico and Sweden. After all, Schürrle, Götze and Reus boast 149 caps and 48 goals between them. And for Reus, taking part in the tournament would have particular significance after injury ruled him out of both the 2014 World Cup and UEFA EURO 2016. "I've been in touch with Joachim Löw on a regular basis in recent months," he admitted in early February. "We text and phone each other often, he's always up to date. I know that if I perform well, I will be a part of the World Cup squad." With just over 100 days to go until the curtain-raiser between hosts Russia and Saudi Arabia, the tournament is only around the corner - and the Dortmund trio could well be hitting peak form at just the right time as Germany bid to become the first nation to successfully defend the World title since Brazil in 1962. Schürrle and Götze have already guaranteed themselves a place in history for their part in the 2014 triumph - but if all goes to plan, Reus will also be involved as the Black-and-Yellow lightning strikes twice in Moscow on 15 July 2018.